I had done a few different centers in the past, mostly with my upper grades, and not very well thought out. This year though, one of my personal goals was to incorporate centers in a way that was well-planned, gave students lots of ways to practice a concept, and gave me more than one way to assess students. I'll have another blog post coming soon about the centers I did, or you can see a video of them on my Facebook page. Today though I want to talk about how to prepare your students for centers in the music room. Before really diving in to centers this year, I talked to some classroom teachers to learn more about how centers worked in their rooms. Each person I talked to said, take the time to go over each center with the whole group before ever dividing the class for centers. Since I don't have as much time as a classroom teacher (my classes are 30 minutes and are back to back), I decided that instead of trying to cram it into the beginning of a class period and then starting centers that day, I would take a class period to discuss all my centers. So I'm going to share with you how that day went. Since this was my first time doing centers at my new school with these students, I had no idea how long it would take to explain all of the centers and how everything would work. 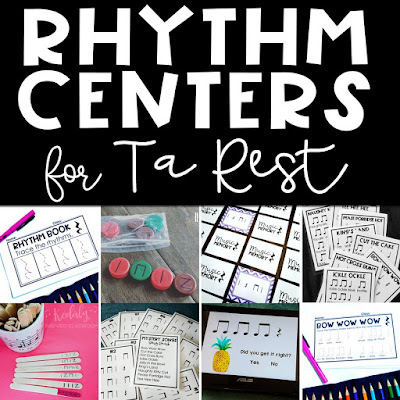 I figured if I have lots of extra time, we will play some singing games that I pulled patterns from for these centers, but this actually took about 25 minutes with both of my classes. I brought my classes in and had them go to their assigned seats in front of the board. 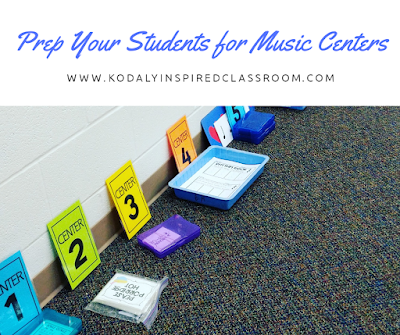 I said that we would be doing something kind of new in music the next few times we have class so I wanted to share with them about it today so that we could spend all of our time in centers the next two times. 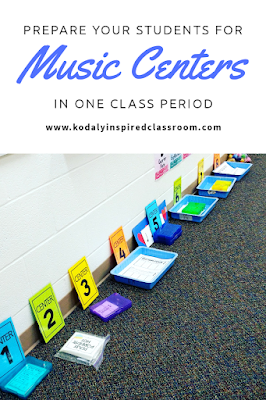 Instead of having all of the centers spread out around the perimeter of the room, which is where I put them when we were actually doing centers, I lined up all my centers at the front of the room under the board. On my computer, I had the zip file that contained all of the PDFs for each file pulled up so that as I was going through them with the whole group, if I wanted them to be able to see something better, I could show them the PDF version instead of the tiny cards I was holding for some of the centers. We walked through all of the centers in order. I read through the directions and we "played" each center one or two turns. For some centers I would have a small group of students come up and be the demonstration group as the class watched. I asked if there were any questions about each center before moving on to the next one. My students knew that they needed to ask any questions they had on this day so that they wouldn't come up asking me questions on the actual center days. The students were really interested and engaged the whole time. I think there was a little bit of mystery to it, like "OOO, I wonder what is going to be at the next center" or "I wonder what those manipulatives are going to be for" and that kept them really focused on what we were doing. Students asked good clarifying questions about the individual centers. They also asked about their groups. I have about 28 kids in each class and set up 8 centers. Most of my groups had 4 students in a group, some had 3. I assigned all groups by typing up a list. I emailed the list to their teacher and asked their teacher to line them up in that order (so the four students in group 1 are first, followed by group 2 and so on....) the next time they came to music. I also had her double check my groups to see if there would be any issues that I maybe hadn't foreseen. This was a really good idea because the next time they came to music, I met them in the hallway and they were all in the right order. I had the centers so that center 1 was closest to the door and then they went in a circle around the perimeter of the music room, so as the students followed me in, I basically dropped off four at a time in the order they were in at each center as we went around the room and I was with the last 3 or 4 students at the "teacher center", center 8. I didn't have to waist any time putting kids in order or reviewing directions for any of the centers. I had directions for each center posted at each center in case they forgot or were absent when we went over the centers, but there seemed to be no issues with students knowing what to do at each center. I only had one student come up to me the entire two days of doing centers and it was because of an issue with a group member, so I think that is pretty darn good for our first time! I hope this gives you maybe a new idea about how to prepare your students for centers so that they feel set up to succeed at each one without needing to ask questions during centers. I feel like taking that day to go over them at a relaxed pace, sending the centers groups to the teacher, and having students come to music on centers day already in order really helped everything to go smoothly. Do you have other ideas that I haven't thought of? Share below! How long in between your explanation day and when you saw the students again to do the centers? For one class it was explained on a Wednesday and then they started that Friday. The other class did the explanation day on Thursday and didn't have class their next time on Tuesday so they will be doing it this Thursday, so a full week between. I'm sure the class that got to do the centers more closely to the explanation day will go a little smoother. That is definitely something to consider. I had forgotten about missing the class this Tuesday for class parties otherwise I might have waited a week to keep everyone on the same page. If you are on a rotation where you only see them once every four or five days but you have a longer class period of 45 minutes + then I can definitely see explaining the centers the same day that you do them. I see my kids 30 minutes 2-3 times a week depending on the Friday rotation. I see my kids once a week for 45. minutes. Yes a week seems like a long time in between. I tried to do rotations in the past and it was a total fail. This was helpful, even if I did the rotations the same day somehow. I wanted to report back about my B day classes who ended up having a week in between because of Valentine's parties. It still went very smoothly. No one came up to me unsure about what to do at any of the centers, so I still think it was worth it to prep in advance and not try to shove the explaining in during the same class period, because the next time they came, even though it was a week later, their classroom teacher had them all lined up in their groups and they came right in and got started. I had directions posted at all centers and I explained the rules at my teacher center. Went without a hitch!